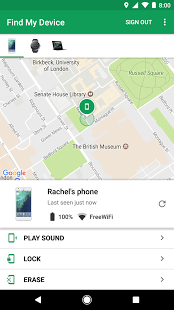 Guide to track your lost Android phone from another smartphone using the new Google Find My Device app. 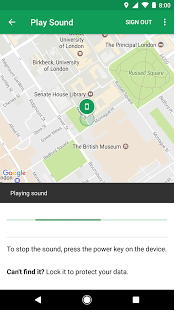 Find my device is the new Google tool to find lost Android phones. From the GPS coordinates, the application shows on the map the location of the stolen or lost cell phone. The new app comes to replace Android Device Manager, adopting Google Play Protect as a security system. While it's new, the application has maintained the functionality of the old Android Device Manager, allowing you to fire alarm on the lost phone, lock the smartphone and delete the data remotely with the touch of a button. Step 1. Install Find My Device on your smartphone where you'll be locating Android. When you open the app, click "Sign in as guest." Then enter your Gmail account and tap the "Next" button. Step 2. Enter your Gmail password and press "Sign in". Finding my device will immediately show the location of your phone on the map. In this screen, you can also cause an alarm to sound on the lost smartphone by clicking "Play sound"; Lock the device by PIN, pattern or password, and delete all data from the device. Step 3. On the lost cell, a notification will be displayed as soon as Find my device finds the device. The Google app will also identify if you have found Android and have it on hand. Nice information, It is new for me to know that google can track our mobile, If It is possible then It is the best things consider in tracking field. But we can track it through GPS tracker and If anyone want to buy best GPS Tracker system at best price, visit on back2you.